Web Login Manager is an Internet Explorer Password Manager that enables you to automatically log in to your favorite web sites with just one click. It is integrated with Internet Explorer and is accessible from a toolbar that becomes a part of Internet Explorer, HTML page context menu or Internet Explorer menu. Web Login Manager saves all login info from web form as your profile and easily completes and submits login form when you use it. ...... protected encrypted location on your computer and easily completes and submits login form when you next time select this profile. 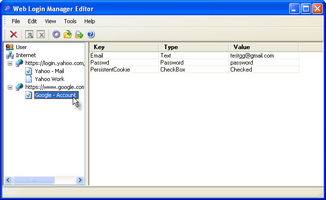 Web Login Password Manager supports import of Internet Explorer AutoComplete usernames and passwords. IE Password Manager. Easy to use and edit saved login profiles. IE AutoComplete. Qweas is providing links to Web Login Manager 1.22 as a courtesy, and makes no representations regarding Web Login Manager or any other applications or any information related thereto. Any questions, complaints or claims regarding this application Web Login Manager 1.22 must be directed to the appropriate software vendor. You may click the publisher link of Web Login Manager on the top of this page to get more details about the vendor.